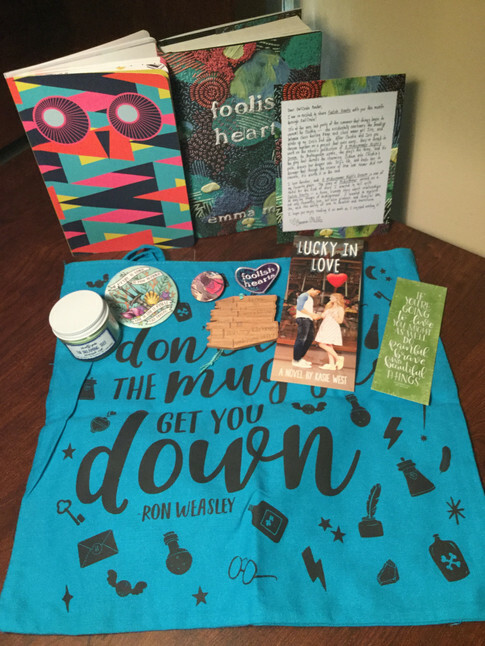 This month's Owlcrate theme was Seize the Day, and it had a lot of stuff in it! To start, we have two bookmarks, one is an advertisement for Kasie West's book Lucky In Love, and the other has two quotes on it, one from The Serpent King, and the other from The Perks of Being a Wallflower. Next up we have a magnetic featuring a Rick Riordan quote which says "If my life is going to mean anything I have to live it myself". We also have an ornament from Everything, Everything by Nicola Yoon which says "Love is Everything. Everything." Up next is a candle from Novelly Yours in the scent of The Dream Tree. Last but not least is a tote bag which has a Harry Potter quote on it which reads "Don't let the muggles get you down." Finally, we have the book of the month which is Foolish Hearts by Emma Mills. It comes with a signed bookplate and a letter from the author along with a Foolish Hearts patch. Like most other books, it has an Owlcrate exclusive dust jacket too!